"Gamma factor" redirects here. It is not to be confused with gamma function. 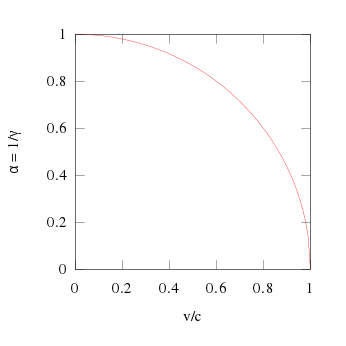 α (Lorentz factor inverse) as a function of velocity - a circular arc. This form is rarely used, it does however appear in the Maxwell–Jüttner distribution. Using the property of Lorentz transformation, it can be shown that rapidity is additive, a useful property that velocity does not have. Thus the rapidity parameter forms a one-parameter group, a foundation for physical models. The first two terms are occasionally used to quickly calculate velocities from large γ values. 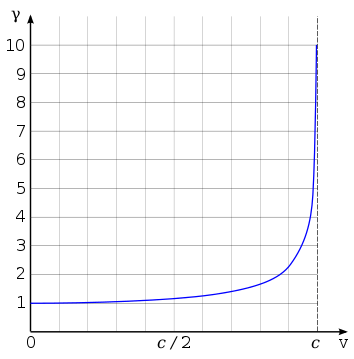 The approximation β ≈ 1 - 1/2 γ−2 holds to within 1% tolerance for γ > 2, and to within 0.1% tolerance for γ > 3.5. The standard model of long-duration gamma-ray bursts (GRBs) holds that these explosions are ultra-relativistic (initial greater than approximately 100), which is invoked to explain the so-called "compactness" problem: absent this ultra-relativistic expansion, the ejecta would be optically thick to pair production at typical peak spectral energies of a few 100 keV, whereas the prompt emission is observed to be non-thermal. 1 2 Forshaw, Jeffrey; Smith, Gavin (2014). Dynamics and Relativity. John Wiley & Sons. ISBN 978-1-118-93329-9. ↑ Young; Freedman (2008). Sears' and Zemansky's University Physics (12th ed.). Pearson Ed. & Addison-Wesley. ISBN 978-0-321-50130-1. ↑ Cenko, S. B. et al., iPTF14yb: The First Discovery of a Gamma-Ray Burst Afterglow Independent of a High-Energy Trigger, Astrophysical Journal Letters 803, 2015, L24 (6 pp). Merrifield, Michael. "γ – Lorentz Factor (and time dilation)". Sixty Symbols. Brady Haran for the University of Nottingham. Merrifield, Michael. "γ2 – Gamma Reloaded". Sixty Symbols. Brady Haran for the University of Nottingham.